No matter how good your copier machine is, there is great chance of running into a paper jam eventually. Paper jams are just a part of life in an office setting. 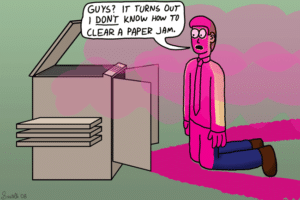 Luckily, if you know how to handle it, a paper jam is easy to take care of. At Denver Copier we believe in making things easy, and today we want to help you understand what to do when avoiding a pesky paper jam. Paper jams are easy to handle on your own, but if you are careless it can lead to big problems. Copiers have a lot of moving parts and need to be treated with care. For this reason, it is important to be gentle when fixing a pesky paper jam. Locate the jam. The cause of the jam will usually be in the paper tray. If you are unable to find what’s causing the jam then you may need to open the copier and look inside. Remove the jam. Find what’s causing the jam and remove the block. Do not yank or tug hard on the paper. This can make the paper rip, or worse, cause something to break. Check for scraps. Make sure that you removed all small pieces of scraps. If a paper rips take extra care to clear everything out or you may run into the same situation. Run a cleaning program. This will help you remove any dust from the brushes and clear away any tiny pieces of paper. If you are still having trouble then call Denver Copier today. We can help you troubleshoot whatever the problem may be to get you back in action. A pesky paper jam should not get your down, and Denver Copier is here to help. Give us a call today and get back to working harder, without needing to take a break.